"The Forgotten Gods of Tibet - Early Buddhist Art in the Western Himalayas"
Licensed edition for Switzerland by Verlag Neue Zuercher Zeitung NZZ, Zurich. 160 pages, 185 colour photographs, 8 maps, hardcover with dustwrap, size 31 x 24,5 cms. 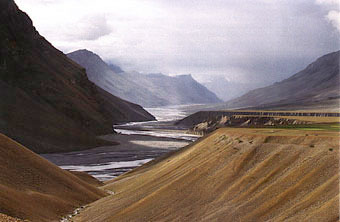 Spiti and Kinnaur, two culturally Tibetan regions in the Indian Western Himalayas, were inaccessible for the last 40 years. They are located in immediate proximity to the former spiritual centres of Western Tibet (the kingdom of Guge, Tholing, Tsaparang - nowadays extinct), with whom they were formerly connected. Since politically on Indian territory, the cultural sites located in the area have survived the destructions that took place in Tibet in the 50´s. The region is characterized by incomparable grandeur of mountain deserts with villages lying between 3500 and 4300 metres above sealevel. • They are the most ancient monasteries of the entire Tibetan world that have survived in their original state. (Foundation dates: Tabo 996 A.D., Nako 1025 A.D., Lhalung 1130 A.D.). In Tibet itself comparingly ancient monasteries have been destroyed or repainted. • The monasteries house incomparable murals and sculptures of worldrank. Here one finds the largest assemblage of Indian influenced early Tibetan art preserved in its original state of execution from 1000 till 800 years ago. Some of the only „living“ examples of the extremely rare and aesthetically precious since very refined Kashmiri and Kadampa styles of art (normally only known from bronzes and painted scrolls). Most of the few references of these styles are kept in the Metroplitan Museum of Art, New York. This is also the reason for the UNESCO´s enthusiasm about this book (preface by Madanjeet Singh). • Due to their notable state of preservation these monasteries immediately tell about the spiritual background of the „Second propagation of Buddhism in Tibet“, a movement that started from these monasteries (especially Tabo) in the 10th and 11th century A.D. and which led to the final conversion of the entire Tibet to the Buddhist faith. Its advocates (Rinchen Zangpo, Atisha, Domton, Yeshe O) were the founders and designers of the monasteries described in this publication. The philosophical concepts found in these monasteries therefore are testimonies of the ideas of this movement. Thanks to these historical persons and their translations of Indian Buddhist texts many important parts of Buddhism have been preserved which otherwise would have been lost forever. • The monastery of Tabo is the only religious site in the world where one can enter a three-dimensional mandala. Designed on the basis of the early Tibetan Buddhism, 32 stucco images on the four main temple walls and one central deity let the entering become the centre of the mandala himself. The famous Italian tibetologist Guiseppe Tucci has called Tabo the historico-culturally most important Tibetan monastery. It is spiritually connected with the largest Buddhist building of the world - the stupa of Borobudur at Java. 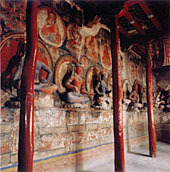 The southern wall of the Tsug Lhakang of Tabo monastery with its figures of the Vajradhatu Mandala. "The Forgotten Gods of Tibet" is the first and only comprehensive documentation with 185 colour photos about the five most important monasteries of the region - Tabo, Lhalung, Nako, Dhankar, Pooh => standard work. The historic and philosophical / psychological connections are described in detail and in appealing manner (eight maps and graphs). Because of the different styles of different epochs frequent in the temples, the book is also a comprehensive description of Tibetan art in general. Rare views of important pieces of art published for the first time ever. In 1933 the famous Italian tibetologist Tucci dedicated one of the books of his series `Indo-Tibetica´ to the region. Through "The Forgotten Gods of Tibet" a rediscovery in phototechnically appealing manner of what Tucci photographed for mere documentary reasons has become possible. Along with the book an Audio CD entitled "TABO - Mandala in Stone" was released. It features the music of Peter van Ham´s multivisional show on Tabo monastery.